I am publishing this project after many year from its idea and realization. 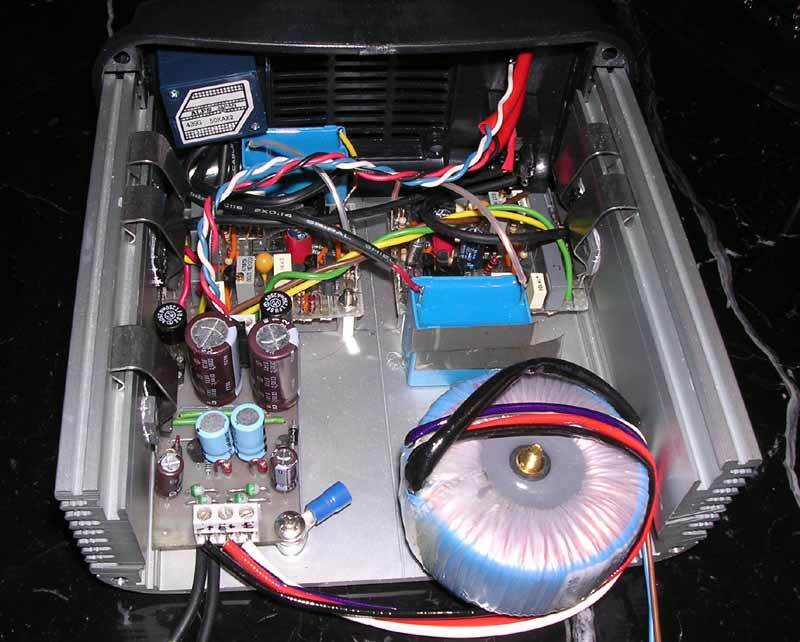 The project is born before to start to play with vacuum tube. 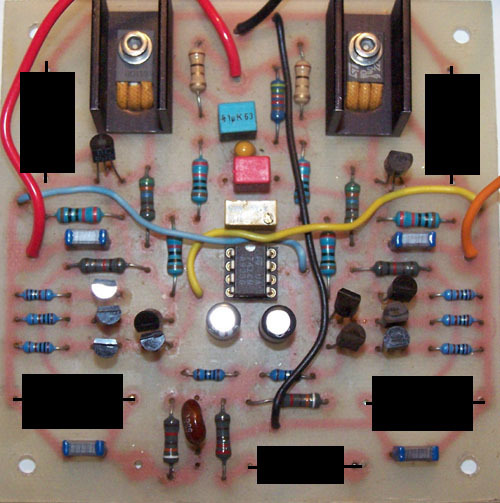 At this time I think that this project could be a very interesting solution if you don't want use vacuum tubes. I think in any case that my SESS vacuum tube amplifier is the best solution to drive any headphone with an impedance from 250ohm to 600ohm. The new simulation, the measurement and the listen test have demostrated that this transistor only project is a very hi-end amplifier. 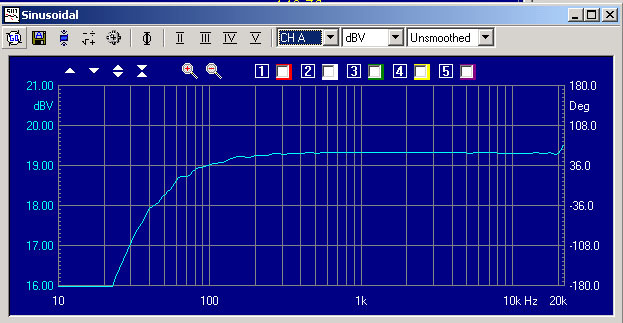 It could drive any kind of headphone, from the 30ohm of a Grado to the 300ohm of the Beyerdynamic. 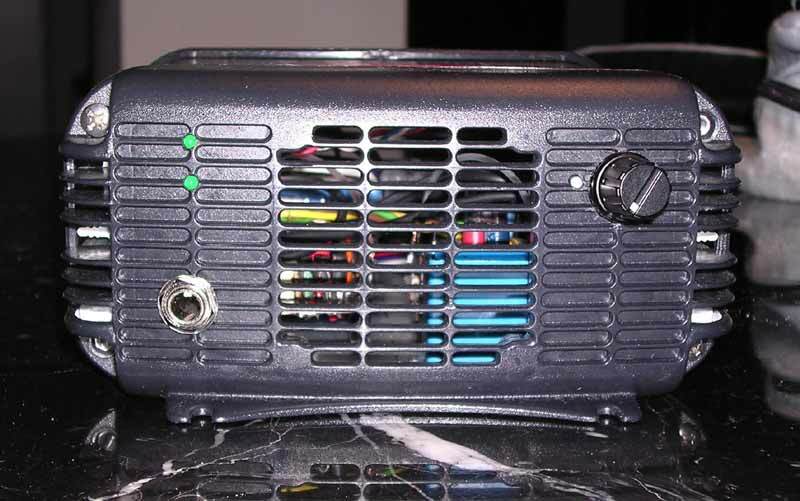 The schematic has been develop on the idea coming studing the Pioneer input stage of the Exclusive series amplifiers A-09 and M6. 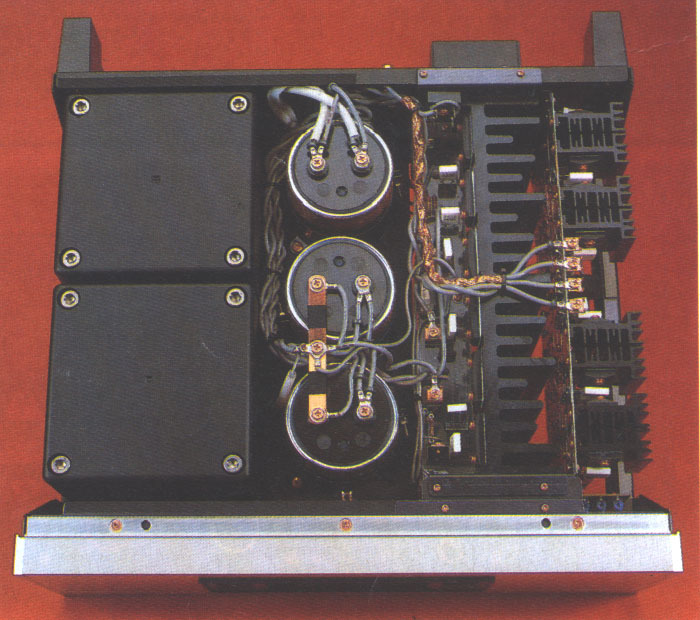 The configuration of these amplifers use current mirror and a pnp-npn follower to compensate the distortion of the transistors. we will get this following configuration. The performances of this design has been optimized with electronic simulation using the WinSpice .3.1 software for Windows. That is a very good result!! 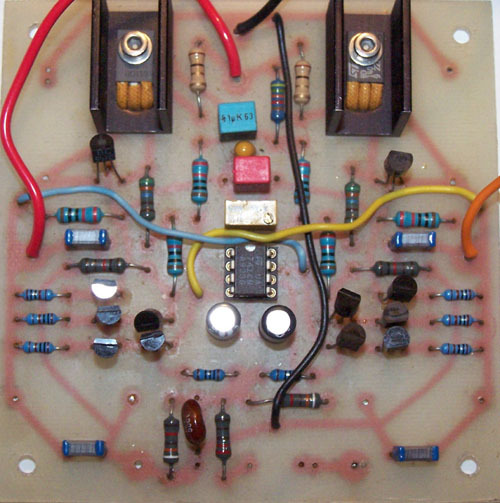 This project does not use esoteric components but common good transistors easy to find in any electronic shop. All the NPN are BC547, all the PNP are BC557 and in the output stage the final are BD139 (npn) and BD140 (pnp). These are some capacitors suggested for the ultra fast by-pass 0.01uF - 0.1uF and for the 1uF 50V-63V. 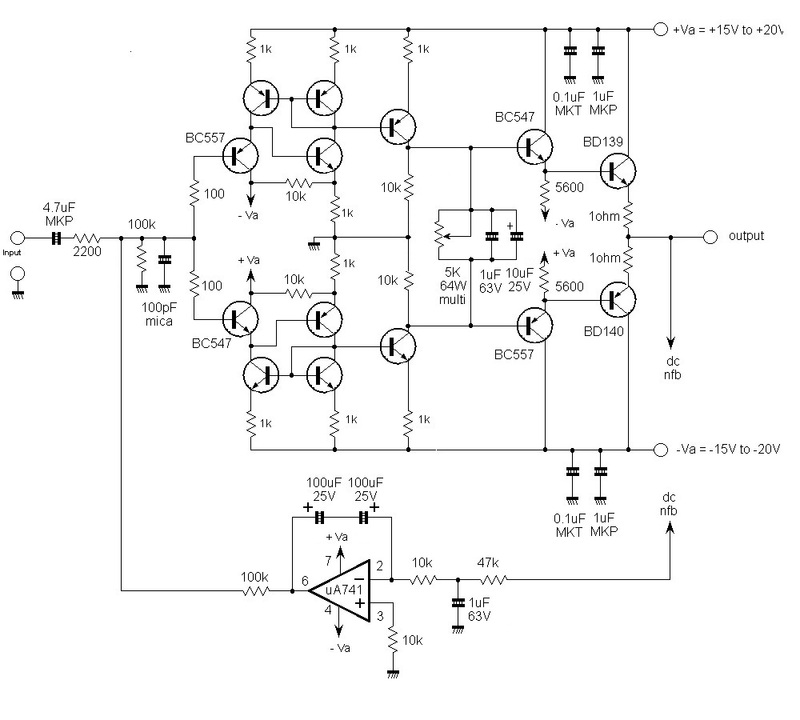 About the fast by-pass and as input I suggest to use the very good Auricap capacitors by Audience. 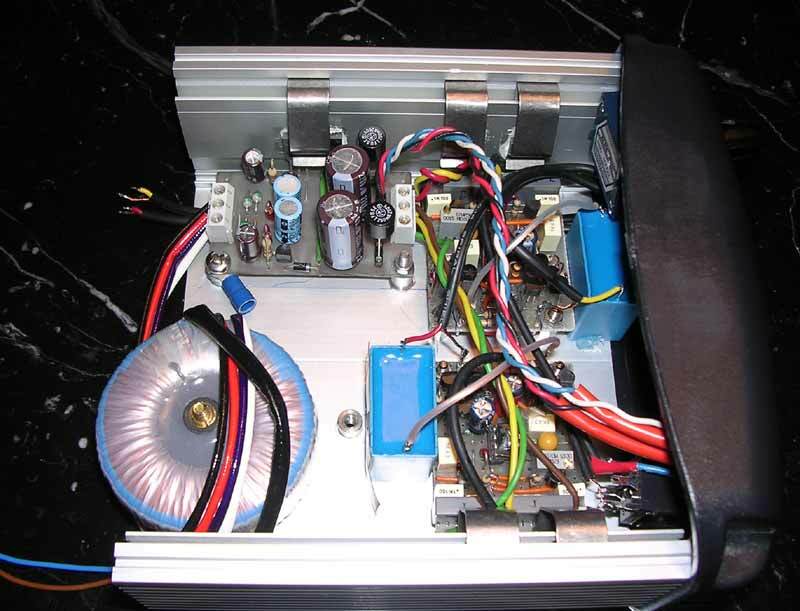 Each channel will use 4 x 1uF 200V as by-pass onf power supply and 1 x 4.7uF 200V in input. 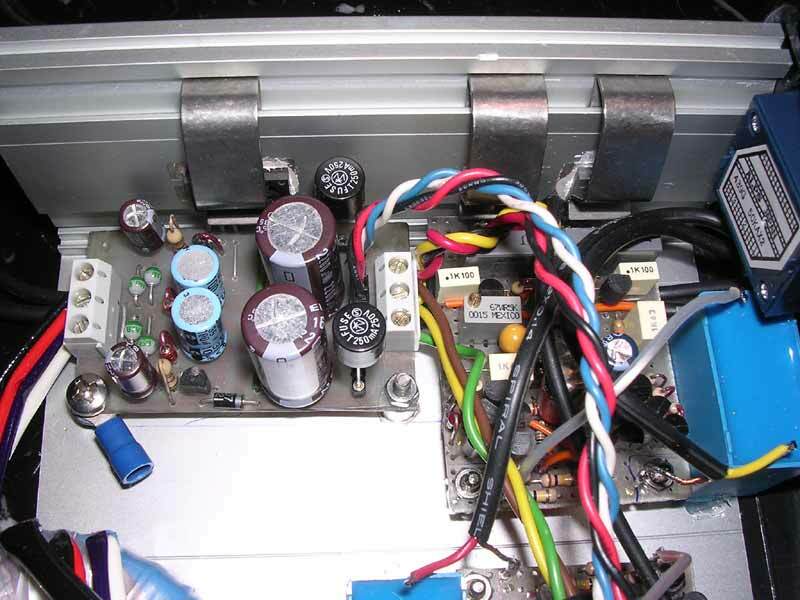 The high frequency cut-off is composed by the 2200ohm input resistor and the 100pF Silvered Mica capacitor. and will have this look if we insert the by-pass capacitors to increase hi-frequency performances. If you are interested to another layer without pcb see these implementation by Consuelo Borghesi. 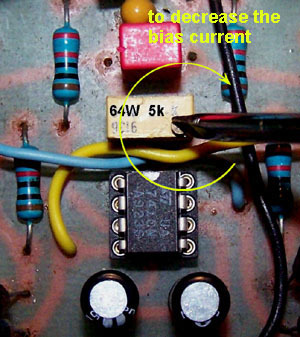 Before to power up the amplifier you need to be sure that the bias control is set for the minimun current otherwise you could destroy the final stage BD139/BD140. I know that could be not easy understand which is the rigth way to turn the trimmer but if you use the suggested Spectrol multi-turn trimmer you just need to follows this image. 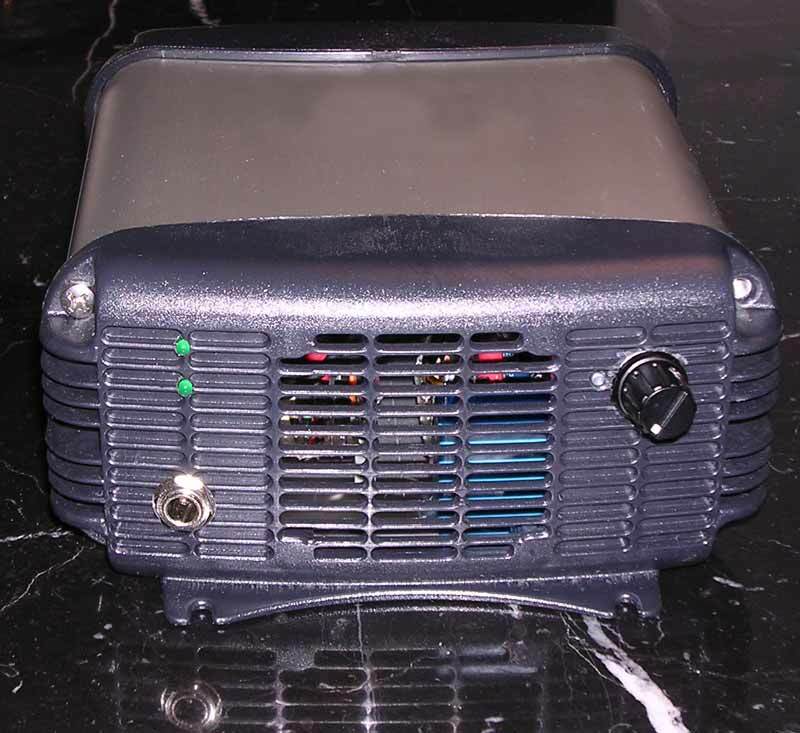 Now you can power up the amplifier with any 12V-0-12V to 20V-0-20V dc power supply. 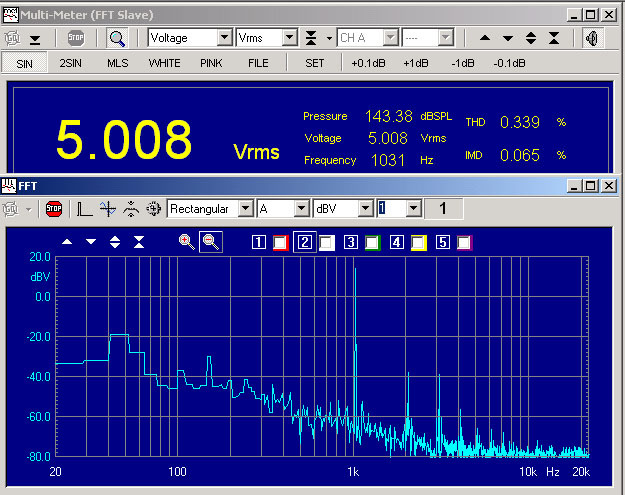 Usa a multimeter to measure the voltage accross one of the two output resistor and start to search your target curent. 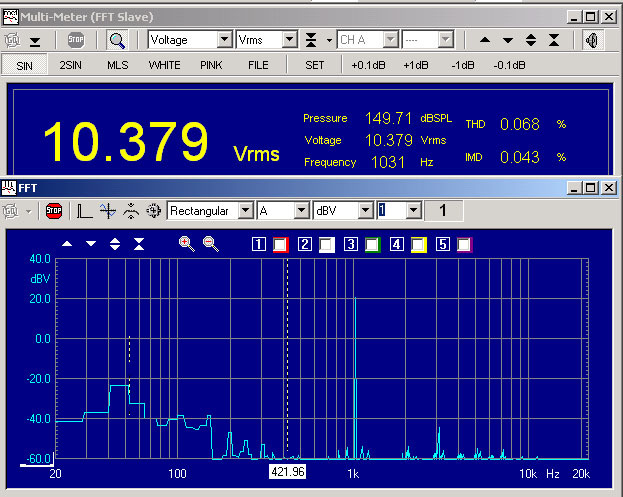 Ofcourse the current will be egual to the voltage read because the value of these resistors is 1ohm. 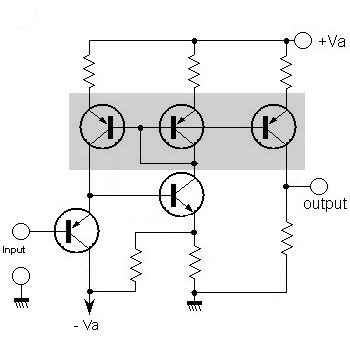 I suggest a bias current about 50mA and never more than 100mA because in this circuit there is not a termal compensation (it is easy to add if you need). After set the bias current wait 15 minuts to be sure of the value. 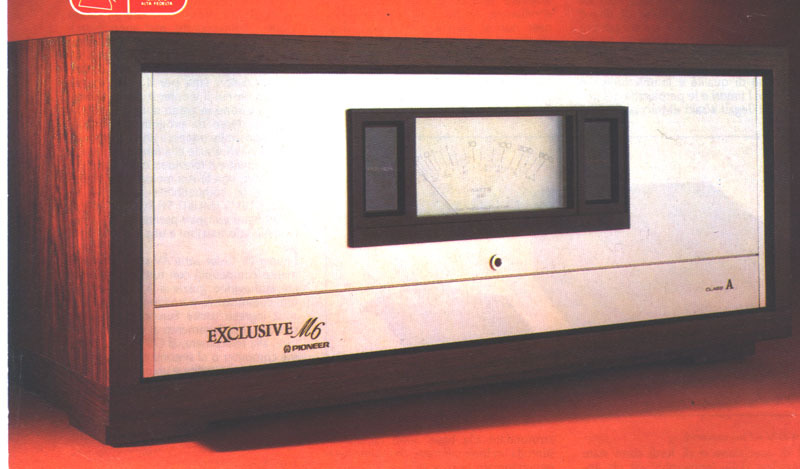 The distortion spectrum driving with this amp. 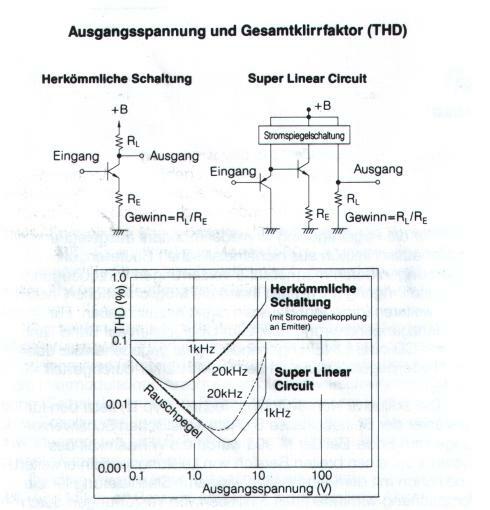 an 200ohm load with about 30mA bias current, is perfect, the distortion is near 0. The frequency response of first version using an 1uF input capacitor, the low frequency cut-off is about 25Hz (-3db) so little too high.